All they said was 2020. Guess all we can assume is this time next year. Was due for a return to Anaheim. Probably rules out attending for me, but you never know! Was honestly hoping somewhere closer to me like back to Orlando or maybe Dallas. But I'm telling myself that I'm going to save up to go next year! Might actually go next year then, seeing as Anaheim is relatively close to me. Gotta make up for wimping out in 2015, in any case. Probably zero chance of Celebration ever being held in Canada, eh? Going to Anaheim next year if I can save up enough. Couldn’t make it happen this year but I had so much fun in Orlando. It'll make it more likely that they'll do a special Galactic Nights thing in Galaxy's Edge next year at Disneyland (it also helps that the park is literally right next to the convention center -- you can see the back of Radiator Springs Racers along the sidewalk near one of the entrances). Galactic Nights was the highlight of the Orlando Celebration for us. The actual convention itself was pretty meh, especially compared to Anaheim the previous year. On another note, it was nice to be able to to talk about Star Wars again on this board this weekend. The last 18 months have basically been the Clone Wars with all of those duplicate garbage threads. Galactic Nights was SOOO much fun. OP has been updated with panel archives and highlights of the past few days. Im gunna need explanations on some of those bingo's lol. -Which familiar faces are in Mandolorian? Since that's apparently IG11 and not IG88. -Which familiar character is in Fallen Order? The Second Sister from Marvel Star Wars is in Fallen Order, not sure if she can be considered ‘familiar’. 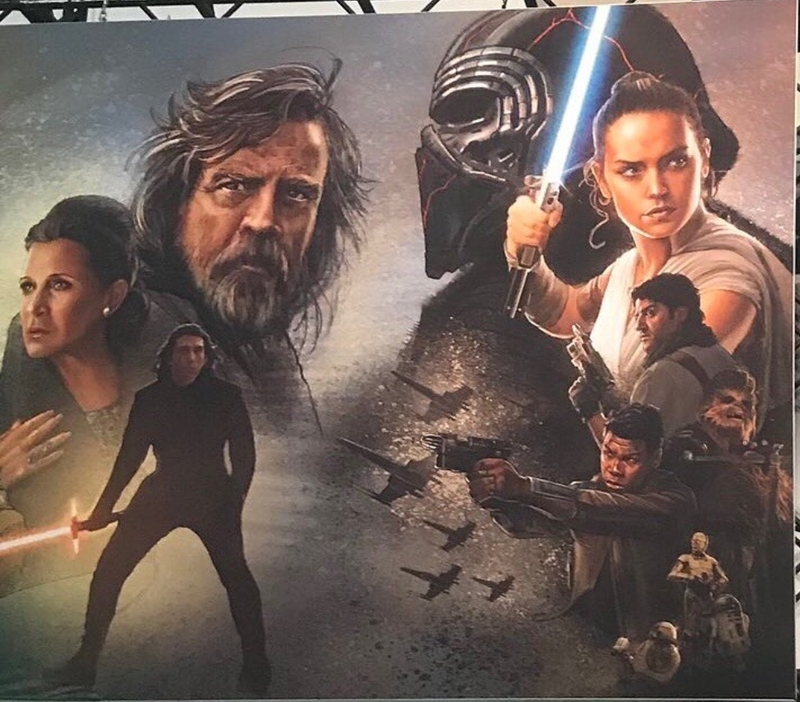 Just saw that one of the Galaxy's Edge sabers appears to be a Temple guard saber, pretty cool. 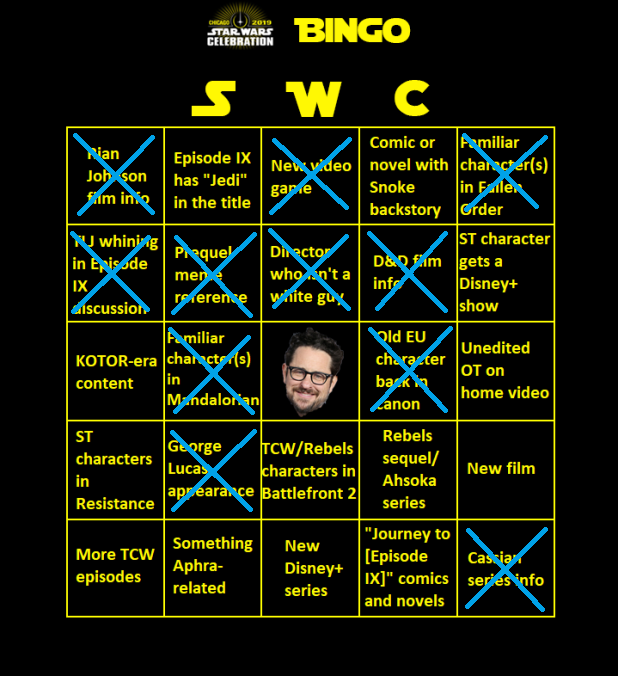 - It wasn’t announced at a panel per se, but that Rian and D&W are collaborating and that their trilogies are connected in some way narratively, is substantial info. He was actually reintroduced into canon a couple months ago in the Han Solo: Imperial Cadet comic series. Also, while I didn't specify, I definitely wasn't counting TV shows for the "Director who isn't a white guy" category. I wonder what that means for the setting of those films. We know Rian's trilogy won't be in KoTOR era, but I was hoping D&W might. And we got some rumor pointing to that a while back. My highlight watching this years stream. - Watching on Sunday, During The Mandalorian Panel, despite not seeing any footage (legally). At the last minute I was asked by my sister to look after her kids as her partner was in hospital, well trying to get my Neice & Nephew to sit still is impossible, even though they sorta like SW, but at 4 & 7yrs old they don’t really care they'd rather be swinging from the ceiling causing mayhem haha (jk) but anyway My sister left them with their kids tablets, so they were distracted enough that I could also keep an eye on my dad (bad mental health & slight memory issues etc) Anyway my dad was watching the stream with me on my parents 4K TV, that was nice since I only just about have a ancient 1080 TV, which I was watching it on the previous days, anyway my point was my dad has never seen these Star Wars streams let alone doesn’t know about Celebration, he barely knows what YouTube is, is not very technical minded with modern technology. But man the Smile on his face, as years ago he loved Star Wars before his issues, so to see him smiling and happy about seeing people talk about Star Wars Mandalorian & the images they shared and they Re run the episode 9 Trailer afterwards etc and then everything else for about 3 hrs was awesome to me, I couldn’t have asked for a better moment especially as my dad never cares about much nor focuses on anything that he doesn’t want to apart from in his own time, but I originally put it on for me & my sisters kids to watch & he ended up watching too. Everything else was a bonus. I think my favorite thing to come from this Celebration was Filoni in the Mandalorian BTS video wearing a shirt that just says "WOLVES"
Any ideas on when tickets will start going up? I'd like to go, but planning a trip from Minnesota will be a bit cumbersome without advance notice. I hope they make the Padme pin-up on a ship official canon in the new Clone Wars season. You could just stop the sentence right there and that would sum it up for me. Also, for all the other Celebrations. Weren't they forced to remove the Lucky Lekku after a few appearances? Just wanted to share my deep appreciation for the thread banner. But yeah, the 91 and 57 should be fine on the weekends. There’s always some kind of backup on the 57 south where it meets-up with the 60 during the day, but it’s not too bad on the weekends. Parking’s more of an issue. They always set-up “event traffic” signs to direct you to parking near Angels stadium, where you have to hoof it or take a shuttle to and from the convention center, but there’s a parking garage at Garden Walk off Katella that usually doesn’t fill-up until later in the morning. It’s $24 for the full day, but it’s worth it for the proximity and convenience. I've had a Disneyland pass since around 2012 when I graduated highschool, so for cons at the convention center I have a habit of parking in Toy Story because it's free for me. They haven't started seriously enforcing passholders utilizing the parking lot yet. I used to walk to the parks from the parking lot anyway if the line for the shuttle was too long though so it's not much different. So how/when do I get tickets for next celebration? That six-eyes head was pretty awesome. So were the reveal of the cosplay contest winner, and the revelation about the naboo celebration theme, but I wish we got to see those live. So many people gonna go to celebration to hit the galaxies edge/celebration combo. It is going to be a mad house. What was on that one covered part of the large mural? I missed it. 1) No more films to promote whilst they’re on the mini hiatus why not Celebrate with a New Box Set of all 9 Skywalker films? 5) Deal with Fox ends on full rights to home media ANH ends in 2020, whilst Disney now owns Fox the timing of the purchase was probably too close to this years Celebration. 6) If I remembered right, maybe it was when all 4 authors from Project luminous were onstage with Anthony, I’m sure one of them said they came to the Ranch (Skywalker) & watched A New Hope? It was Remastered in 2K I believe for Rogue One crew to study, Lucky bastards, maybe they got to see it as a tester for later on? Will some films be 2K not 4K I wonder?